Young readers may have seen reproductions of Leonardo da Vinci's Mona Lisa and even some of his inventions, but there was much more to his genius. Leonardo was also a scientist and a sculptor. He loved the outdoors. 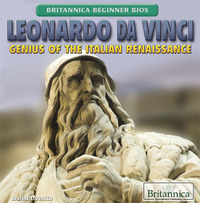 This biography allows young readers to get to know Leonardo from his youth in the Italian countryside and then witness how his work as an adult won over noblemen and royalty who paid him for his art. Readers will be introduced to some of Leonardo's most famous and influential work and discover how it continues to influence today's art and science.